Update: Newzie has not been updated since 2007 and I suggest you give the excellent RSS reader QuiteRSS a try instead. It is the program that I'm using currently to read news on the Windows desktop. Switching from Google Reader to another RSS reader was no easy task. Google Reader provides a very good feed reading experience that is hard to top. The major problem I was facing with Google Reader was not really related to that RSS reader alone but more to the way the account data was handled by Google. I usually fired up Google Reader and kept it open all the time to read new RSS feeds. The problem with that approach was that this meant that I was always logged into my Google account. The Google account was used for other Google services as well. Having read about Gmail and Google vulnerabilities before I decided that it would be best to move from Google Reader to another client to prevent that the account data would fall into the wrong hands. Yes, the likelihood was not very high but the chance existed. Newzie was one of the first RSS readers that I evaluated and I immediately liked it. It was easy to import the opml file from Google Reader into Newzie so that all of the subscribed feeds would be available in the new RSS reader as well. 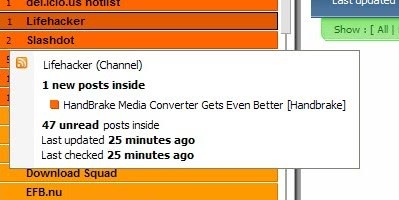 The default display mode of this RSS reader is to sort feeds by the time they were last updated with the most recently updated feeds at the top of the list. This view can be changed to a folder mode that simply lists all feeds alphabetically in their folders. The order of the feeds can be changed and the visibility of the complete menu can be toggled to increase screen size for the actual news items. 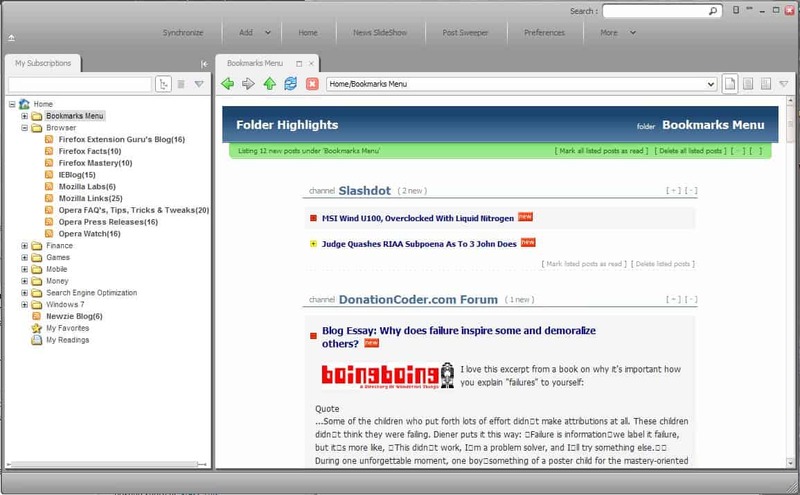 The RSS feeds are displayed in their own browser-like interface. A click on a title or link will load that link in a new tab in the Newzie interface. This is actually one of my complaints that I have with the RSS reader. I would have preferred that links would open in the default browser instead but I guess many users think that reading them right in the RSS reader might be the more comfortable way. There is actually an option to load the link externally but it is hidden in a submenu. List View: Will divide the main interface into an upper panel that is displaying the RSS items and a lower panel that is displaying the contents of the active item. All posts can be marked read, deleted, flagged or copied / moved. One interesting feature of Newzie is the ability to look at the news items of a particular feed by hovering the mouse over the feed. This makes it possible to quickly look at new items that have been posted without having to actually load the feed. New items can be filtered right from the main interface using so called on-the-fly filtering. Commands like title=name would list all posts with name being part of their titles. Other filters make it possible to view only posts that have been updated before, at or after a certain period in time, posts that have been posted in a specific folder or posts that have a certain priority associated with them. There is also a second interesting option which makes it possible to create so called virtual channels which apply word filters to RSS feeds. It would be possible to create a virtual channel that would contain all posts that would contain "portable software" in the body. It is currently only possible to apply those filters to the title, body or all of the news item. These filters can be combined by using AND or OR relations. It would be nice to see support for other information like author or tags added to the filter in the future. Newzie offers another interesting related feature. It can monitor websites even if they do not offer an RSS feed. 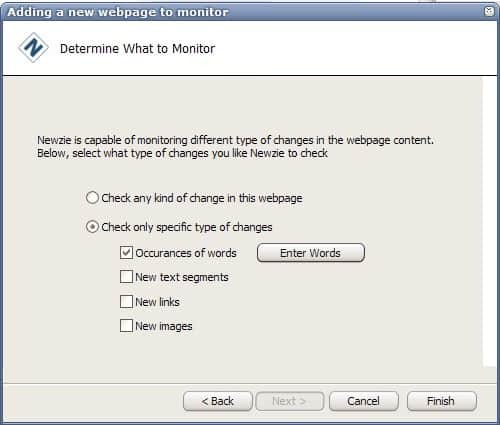 It can monitor any website for any kind of changes or specific changes. Specific changes can be words, text segments, links or images. Those monitored websites would then be added to the same menu containing the RSS feeds. A few more options to customize the RSS reader would be helpful. This would include the option to load links in the default web browser by default, an option to always display only the titles of the items in the overview and the ability to filter additional variables like author or tags. So really you want to be looking at FeedDemon then (which is free these days). Has the advantage that it can sync online with newsgator so like google reader you can read your feeds anywhere. I moved to this after google reader refused to display properly on my Archos 605. I’ve recently parted way with RSS reader that’s part of Opera integrated mail client – it got too slow and hard to manage. Moved to NewsGator+FeedDemon family of services. What I like most that everything is in sync. I can read items at work in browser, on the go with my tablet and when I come home – they are checked as read in desktop client. Only newsreader that I’ve found (so far) that fit all my needs is Feedreader. One that’s almost there is RssOwl, but it still needs to iron out some kinks to be really useful imo. FeedDemon is nice as well but it doesnt do what I need it to, so I can’t really use it. Never heard of Newzie though, gonna give it a try. So how does one get the google reader’s XML output into Newzie?? MartinJB: You click on Settings in the upper right corner of the Google Reader screen. Then on Import / Export in the Settings menu and there on the link Export your subscriptions as an OPML file.